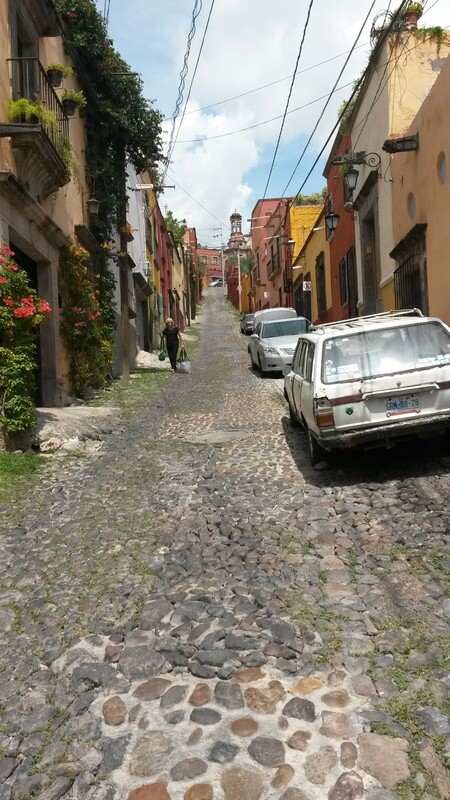 This is looking uphill from halfway down our street, Calle Montes de Oca. We are at the very, very top, on the left. 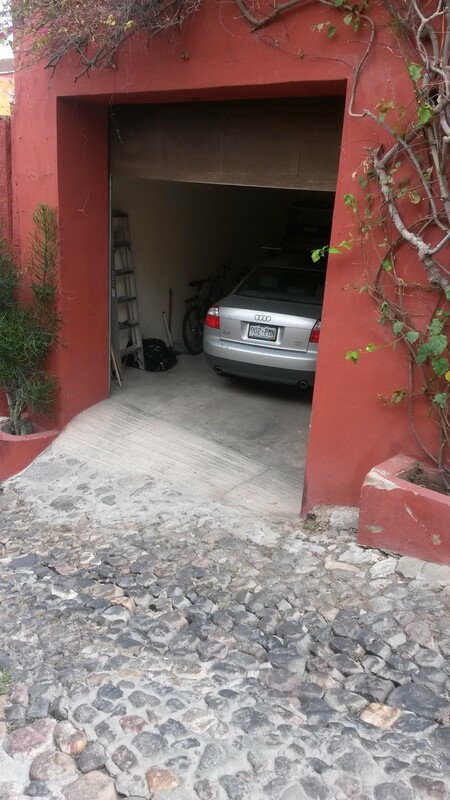 San Miguel de Allende, GTO, MX, July 16, 2014: I have a recurring dream. OK, let’s call it a nightmare, because that’s really what it is, although sometimes it ends more horrifically than other times. It involves me being driven – I’m always the passenger in the vehicle; whether or not that matters, I’m not sure– up a street that becomes impossibly steep. No one in the vehicle realizes it at first, but ultimately it’s too late, and the vehicle either begins to lose traction and falters, rolling backwards faster and faster downhill, or, in the more harrowing version of the dream, I’m in a convertible and it flips back over onto itself, throwing passengers out or landing on top of them. I’m now living on that street. The picture at the beginning of the post was taken from about half-way up our street. It starts out steep at the bottom, but halfway up it becomes really, really steep. Like, steeper than it should be possible to build a road that cars travel over. I’m going to need one of my civil engineer friends to come down and take some measurements, because I’m fairly confident I’ve never been on a publically-maintained road in the U.S. that’s this steep. I’m estimating the incline at forty degrees, although Wiley tells me that’s impossible. If I had only had room to pack my astrolabe…but then, where would be have put the vitamins? 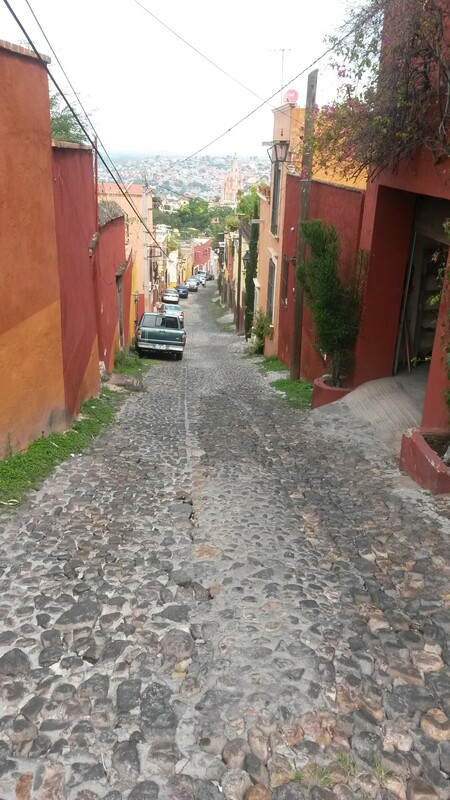 San Miguel is built on a hill. From the very “bottom” of town, where Wiley’s school and our gym are, it’s a gradual climb up to our house, which is still not at the very top of town. 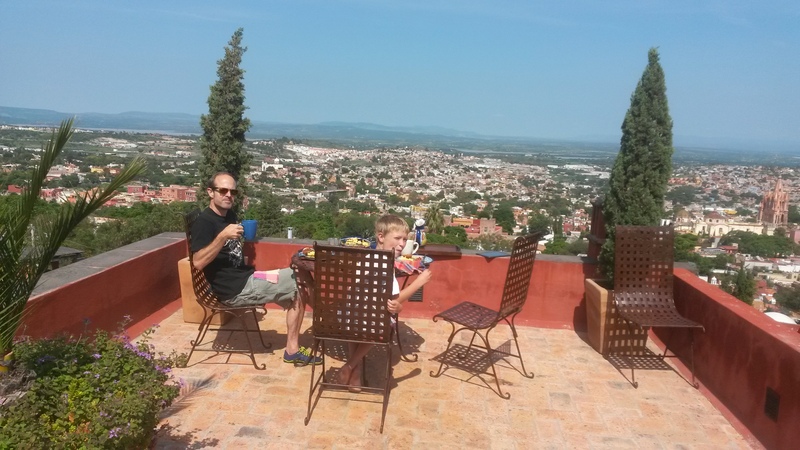 The Plaza Principal, which is the center of town and where the beautiful cathedral, the Parroquia, is located (you’ve likely seen the spires of this amazing structure in pictures taken from our house), is about halfway up the hill. Brunch on the rooftop. Killer view. Parroquia is nearly out of frame on the right. There are definite advantages to the layout. At six-thousand feet the air is crystal clear, and on most days you can see well off in the distance, possibly as much as a hundred miles, from our roof. We have an amazing view of the entire town and all of its beautiful architecture. OK, I’m pretty much done with the upside. The downside is that when you want to go out, you have to eventually come up. Pretty much everything we need is down, so that means the “up” trip can and often does involve carrying things back up the hill. Oh sure, we could drive, but have I explained about our garage? The list of things I have not done since arriving here a little over two weeks ago includes watching television and driving. You don’t really need to drive here, because most everything is within walking distance, but you also don’t really WANT to drive, either. The streets are impossibly narrow, and many are one-way with street signage of variable quality. The oldest streets (including ours) are cobblestone, and the others are flat slate-like paving stones. Both are noisy, murder on your suspension, and slippery when wet. Which they are a lot lately, because it’s the rainy season, and it rains pretty much every day. View from the top. That’s our open garage door on the right. Which is, in fact, what it was doing when we arrived in town. A light mist, to be sure, but rain nonetheless, which made the cobblestones on our street slippery. When driving, you have to approach our house from the top of the street, because our half of it is one-way in the downward direction. The street itself is approximately the width of one and a half small cars, and all of the houses are right next to each other, forming a continuous wall and giving new meaning to the term “zero lot line”. As you teeter over the brink of the crest of our street and start your freefall down, immediately on your right you’ll encounter our front door and then our garage door, which is a ninety-degree turn from the street. It’s so sharp it’s impossible to execute with one turn, and the extremely steep “lip” that carries you up from the street to the garage floor threatens to crush your front end, especially if the car you’re driving is laden with a year’s worth of stuff (mostly vitamins, ha-ha), three bicycles, two Chihuahuas, a stressed father, a panicked child, and an overloaded Thule box. The car, snug and safe in its garage. But Wiley did successfully get the car into the garage, although our child was permanently traumatized and immediately began planning how, when we leave next year, we will park the car at the bottom of the hill and carry all of our belongings down to it, instead of trying to get it fully-loaded out of the garage. And that is where it has been, quietly sleeping off its sixteen-hundred mile journey, since we arrived. So we walk, a lot. There has been talk of buying a scooter, although at the moment it’s just talk. Most days I make the trip up the hill three to four times, between shopping, walking the dogs, and delivering Wiley IV to his appointments. I keep score, and make it a point to report nightly on my trips to gain sympathy, which rarely works. Ultimately my calves will no longer fit in my jeans, and I’ll have that, at least. Just returned from taking the dogs to the park, upon which I witnessed a woman running over someone’s stoop on Huertas, the next block over from us, then proceeding to tear off her driver’s side mirror on a house when backing up. The car emitted a nasty hissing noise with steam, as if a fatal injury occurred somewhere under the hood. Definitely, she should have walked. As I understand it, one of the the purposes of this trip was to be a learning experience. It sound like you have learned about steep hills, small streets, and hopefully better home selection criteria the next time you do this. Thanks for the thought, Jim. It’s an interesting point, and one we’ve spent some time pondering. We looked at close to 20 houses and this one was (and still is) our top choice. There was another one that was in the lower section, close to Wiley’s school, that I loved. But I wouldn’t trade this view for anything. It’s amazing 24 hours a day. Perhaps better garage selection criteria would be in order, next time. Great post! Sounds like the learning experience is officially underway. You guys are my heroes!